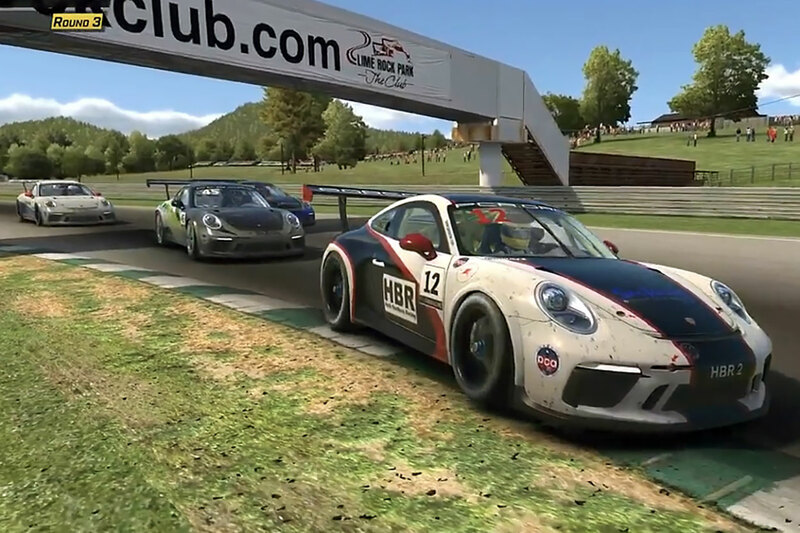 Above: PCA Sim Racers mix it up during Round Three at Lime Rock Park. James Huth of Hudson Champlain Region took first place at the PCA Sim Racing Series race at Lime Rock Park, followed by Michael Polasek of Northern New Jersey Region in second, and Leif Peterson of Maverick Region in third. Congratulations to the podium finishers! Round Three of the PCA Sim Racing Series provided more close and competitive racing. Each of the three races have had different winners. 30 Porsche GT3 Cup cars racing on the short and narrow Lime Rock circuit is a must see! Watch the recorded broadcast below, or click here for the direct link to YouTube. With three races in the history books, the dynamic PCA Sim Racing Series now moves to Watkins Glen for Round Four with a live broadcast Friday, March 22, 2019 at 9:15pm EDT. The 45-minute race will feature professional broadcasters adding excitement to the racing action. Watch the live broadcast below or click here for the direct link to YouTube.